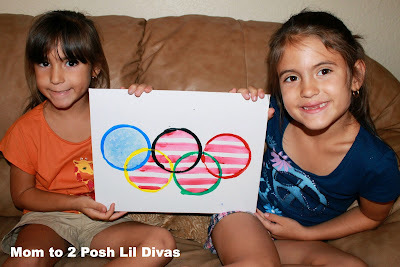 I am excited about the Summer Olympics (just check out my Olympic Fun Pinterest Board!). This is the first time the girls can appreciate what it is & watch the games. To introduce them to the entire concept we spent some time online. I showed them the Olympic Rings and we discussed what they symbolized and took a peek at this years posters (they weren't too impressed). I wanted to make something symbolizing the games that we could display at home but I wasn't in the mood for a huge mess or fuss. Yes, I have those days too. Lots of them actually! I had decided we would recreate the rings - short, simple & minimal fuss. The girls decided that was "boring" and quickly vetoed my idea. It was 2 against 1. I held firm telling them if they wanted to do something different they would have to come up with the idea themselves. No problem, Mom. 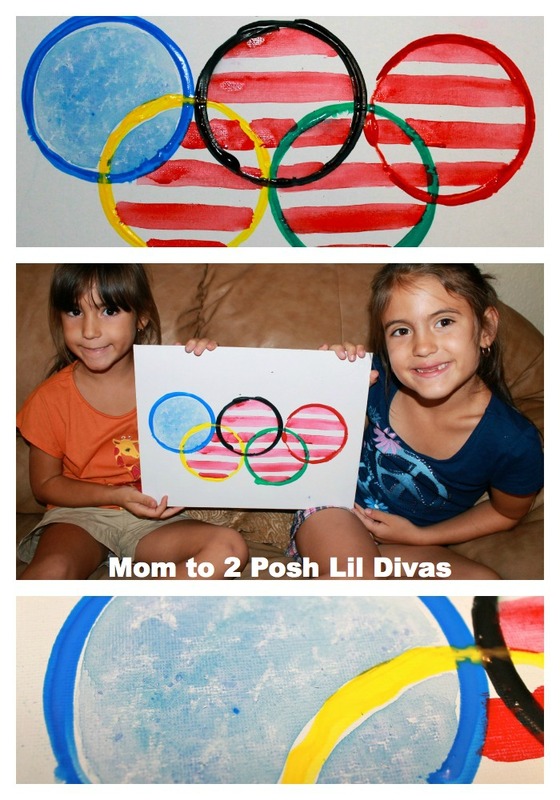 After a few minutes the Oldest Diva excitedly yells that she has the "perfect" idea - let's paint a flag inside the rings, Mom. The American flag. I couldn't help but smile. It was a good idea. 1. We used plastic snack bowl lids to make our circles. I thought they were a nice size for our canvas. 3. Using watercolors, we painted the blue circle blue and added red stripes to the rest to represent the American flag. 5. Using a white crayon, we drew some stars onto the blue circle. 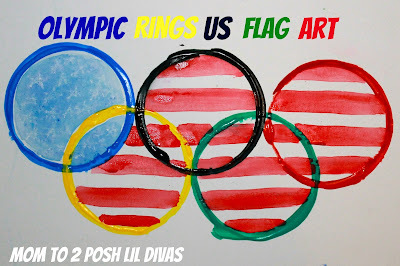 We had our Olympic Rings & the American Flag. We will proudly display this during the Olympic Summer Games! You always have such fun ideas! I just wanted to let you know that I included your fabulous blog in my Homeschooling 101 post as a great resource for fun ideas! Thanks for sharing all your ideas with all of us! What a very cute idea to combine the olympic rings and the American flag. Wonderful. Looks great. Really great idea - I love the flag inside the flag. What a great art project to tie into the Olympics! 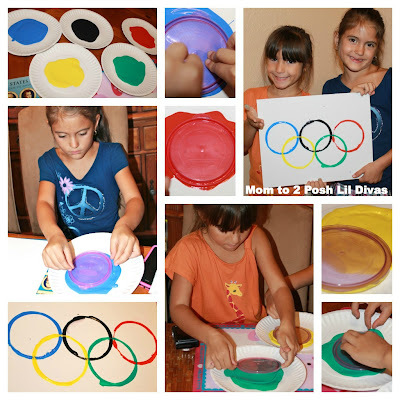 We haven't done any projects with the Olympics, and this is an idea my daughter and I would enjoy. 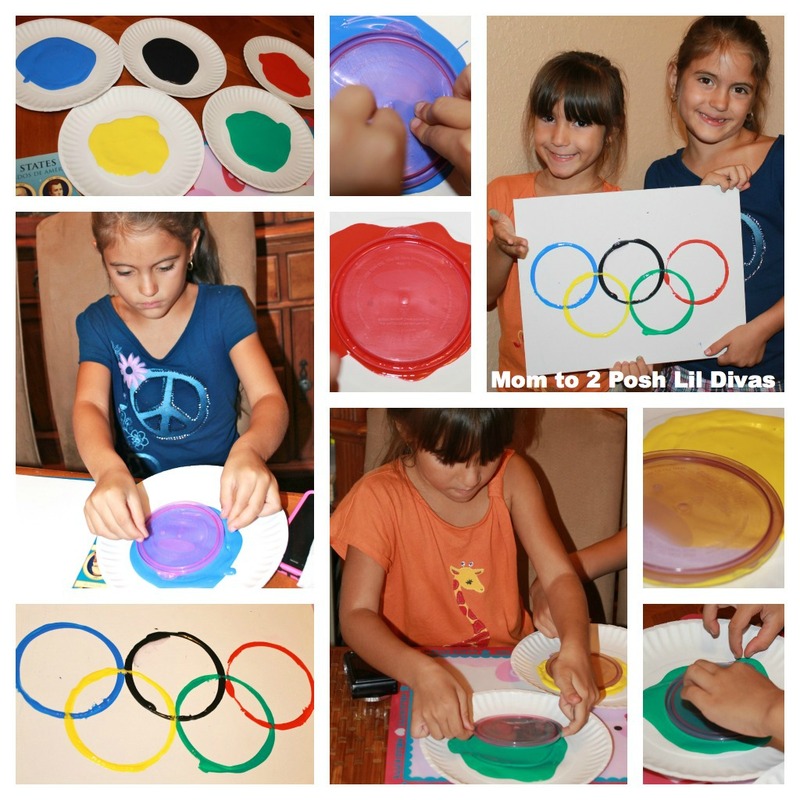 sweet project, thanks so much for sharing on craft schooling Sunday! love it Bern! such little creative stars you have, great mom as example!